Zoe Ardelay's life in her small village is turned upside down. Right after her father's death, Zoe is informed that she is to become the king's fifth wife. Ruled by the element of water, coru, Zoe follows the ambassador to the city, only to walk away from the edict and go to the edge of the great river to hide and rediscover herself. What Zoe finds is that not only does she carry the power of water with her, but she is coru Prime, a power unto herself. Faced with the challenge of rediscovering her family's place in the palace, and the challenge of the secrets that had laid buried within the palace walls, Zoe must decide for herself how much power she has, and for whom she will use it? Sharon Shinn sets forth into a new world where the elements rule. Each child is given three blessings upon their birth, traits that comes from five elements (earth/skin, air/breath, fire/mind, water/blood, wood/bone). Zoe's blessings include beauty, love, and power, a trait that is shown more and more life as the story goes on. More blessings can be drawn at temples for guidance, and Zoe finds more reminders and clues to her life and choices at various times in the book through this. I loved the use of the elements and the blessings as stones, charms and such as those are things that I relate to in my own life. Zoe grew up fast. Her mother died many years ago, and she and her father lived far away from the palace that sent her father away in disgrace. Both her internal and external conversations - with herself and others - show that she has not been a child for a long time. However, as many of those who had to grow up quickly, Zoe proves herself prone to selfish feelings and rages, especially when faced with facts about the father she relied on for so long, and truths that she has to accept. Another facet of that acceptance are the friends and family she picks up along the way. From the river banks to the palace to her grandmother's house to the palace, Zoe learns the value of the people that surround her, along with the value of the secrets kept by them. From beginning to end Darien Serlast, the king's advisor, proves an enigma, a friend, and possibly a foe. More unyielding and blunt (being hunti - with power in wood/bone) compared to Zoe's more restless and mercurial coru, she isn't sure what to make of him much of the time. The reveals that come through book prove surprising, although sometimes not, at least in terms of the obvious attraction between the two. Shinn gives a lyrical voice to the ups and downs between Zoe and Darien, their draw towards and fight against each other, and the ebb and flow of the water that Zoe controls both in benefit for and against those around her. Troubled Waters is a beautiful story of a young woman trying to shape her own life among those who are used to being in control. Like the water that is the base of her power, Zoe's story flows from a slow roll through the beginning of the book to a storm-fed river racing to the end. 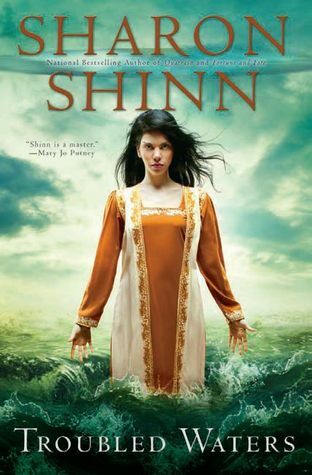 Anyone who has read Shinn's other books, especially the Twelve Houses series, will recognize the strength of her characters and their journeys as ones that bring resolution in a meaningful way.